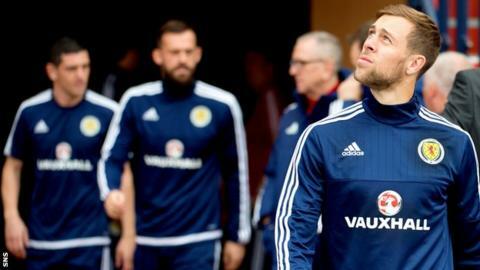 Shaun Maloney and Steven Whittaker have been called up for Scotland home friendly with Denmark on Tuesday. Gordon Strachan had named separate squads for the 1-0 win over the Czech Republic and the game with the Danes, with Whittaker pulling out of the former with his wife due to give birth. Full-back Paul Caddis, who made his debut in Prague, and uncapped keeper Scott Bain have been retained as cover. But goalkeeper David Marshall misses out as he is suffering from pneumonia. Steven Fletcher was named in both squads and, although he missed Thursday's 1-0 win over the Czech Republic in Prague, he is available for Tuesday's encounter at Hampden.